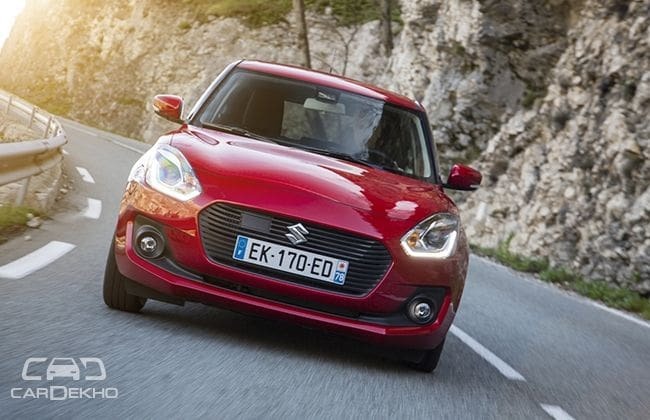 Maruti Suzuki revealed the third-generation Swift for India today. The car will be launched at the Auto Expo 2018. Bookings for the same are already underway for an upfront payment of Rs 11,000 at all 2,300 Maruti Suzuki showrooms in India. The new Swift is based on a lighter and stronger chassis, is more premium than before, comes loaded with features and should get an extensive range of personalisation options. Let us take you through what all is on offer. The new Swift is based on the 5th-gen Heartect platform that also underpins the Baleno and the Dzire. It is longer and wider and hence, roomier than before. The front grille is a single frame multi-slat hexagonal unit flanked by upswept LED projector headlamps with DRLs. The bumper mounted fog lamps come with silver bezels. The new Swift retains the outgoing model’s side profile. What’s changed on the side though are the wheels and the C-pillar. The Swift now gets 15-inch two-tone alloy wheels wrapped in 185 section tyres and flaunts a blacked out C-pillar. The rear gets squarish LED rear lights that jut out of the frame. Dimensionally, the new Swift is 40mm wider and has a 20mm longer wheelbase than the outgoing model. The Swift’s all-black cabin gets satin chrome finish around the instrument panel. Like the new Dzire, the new Swift also gets a flat-bottomed steering wheel. The seating space has increased and so has the headroom, which is now 24mm more than before. The boot space at 268 litres is up by 58 litres and offers more practicality thanks to 60:40 split seats. Maruti Suzuki offers a total of four variants for each engine option. Recommended Read: 2017 Maruti Suzuki Dzire Old Vs New: What All Has Changed?